While the Power System Operation Corporation Ltd (POSOCO) scratches its head about the power grid trip in the north India affecting millions of people, and most of the brains working otherwise, there is a little fact we all have ignored. I found the Zee News India take on the matter to be most informative. The fact that most of us ignore is the power source for the entire Solar System, the Sun. If the yellow star has power to provide energy to the entire system, it does have power to affect planets in a harmful way too! Some facts and figures from NOAA, NASA, and other sources. There's a surprising conclusion of a NASA -funded study by the National Academy of Sciences entitled Severe Space Weather Events—Understanding Societal and Economic Impacts. In the 132-page report, experts detailed what might happen to our modern, high-tech society in the event of a "super solar flare" followed by an extreme geomagnetic storm. According to the report, power grids may be more vulnerable than ever. The problem is interconnectedness. In recent years, utilities have joined grids together to allow long-distance transmission of low-cost power to areas of sudden demand. On a hot summer day in California, for instance, people in Los Angeles might be running their air conditioners on power routed from Oregon. It makes economic sense—but not necessarily geomagnetic sense. Interconnectedness makes the system susceptible to wide-ranging "cascade failures." "The concept of interdependency," the report notes, "is evident in the unavailability of water due to long-term outage of electric power--and the inability to restart an electric generator without water on site." India has five electricity grids -- Northern, Eastern, North Eastern, Southern and Western. All of them are inter-connected, except the Southern grid. All the grids are being run by the state-owned Power Grid Corporation, which operates more than 95,000 circuit km of transmission lines. NTPC's six plants -- Singrauli (2,000 MW), Rihand (2,500 MW), Dadri (1,820 MW), Auriya (652 MW), Anta (413 MW) and Badarpur (705 MW) -- stopped generating following the failure. A coronal mass ejection (CME) produced by Saturday's (28th July) M6-class flare head toward Earth. According to analysts at the Goddard Space Weather Lab, the cloud delivered a glancing blow to our planet's magnetic field on July 31st around 1930 UT or 0100 IST. The northern transmission grid collapsed at 2.35 AM, plunging Delhi, Haryana, Punjab, J&K, Himachal Pradesh, Uttarakhand, Uttar Pradesh, Rajasthan and Chandigarh into darkness. <-- The Sun captured during that time. Doesn’t the time overlap? Aren’t the facts pointing towards a much bigger hurdle than we are concluding? If you read the entire thing again and maybe it shall strike you. Some of us are focusing on these effects which most of us are ignoring. Kevin runs a website SolarHam.net which is the best source for solar data on the internet. 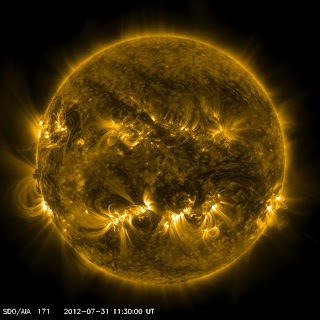 The Sun is being monitored by 24 satellites, SOHO, ACE, GOES being the major ones. The data from these is available to the public and Kevin does a huge job of bringing all the data in one place. 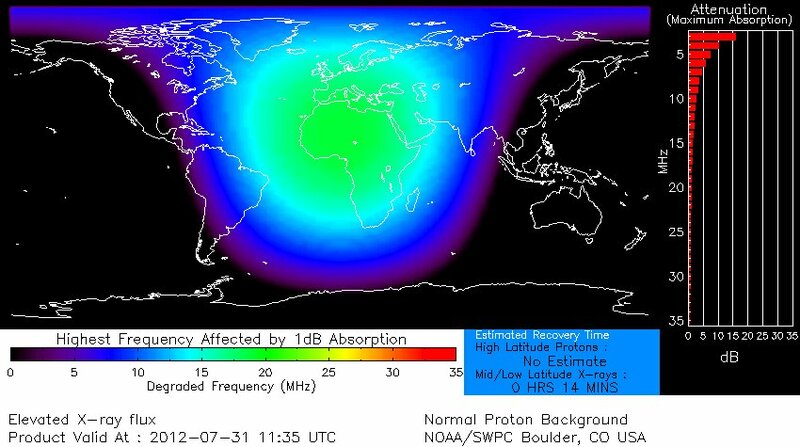 While on other end, Pamela Stiegman from Tonawanda, NY is collecting data about the transformer failures around the world, we are trying to relate these events with the solar events happening on a regular basis. I have a published research paper, titled Communication Blackout: Causes and Effects in IJAEST last year which focuses the effects of Solar Flares on the telecommunication system. An extension of the same research has been selected at ESTEL Conference, Italy due presentation this October. This article aims to educate the general public about the possible effects and to be ready for more such events in the coming days. August 2012 marks the start of the solar maximum for the 24th cycle; a request to the scientific community to kindly look into the grave matter.